This week’s show was recorded in front of a live studio audience at the WCBS studios in NYC! We had a packed house of family, friends, and business owners join us for this special episode. Bob Kulhan (“Improv Bob”) joins Deidre and JG to discuss using improvisation to improve communication and take on business challenges. Bob even walks us through a couple of interactive exercises, including getting the entire theater to shake their hands and feet like they were dancing the Hokey Pokey! 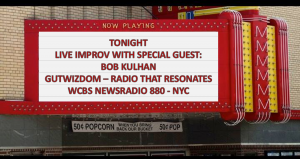 Bob Kulhan is an adjunct professor, author, business consultant, and comedian. On this week’s show, Bob tells us how comedy and improvisation and can help improve business communication and help employees interact with each other more effectively. Bob’s book GETTING TO YES AND (Stanford University Press; January 24, 2017) is a fun and well-researched exploration of how comedy and business not only can mix but can be used to take your business and career to the next level! Communicating: we’re never floating in space alone – we must communicate! Energy and Attitude are choices, so warm up! Too often we look energy and attitude as way beyond our control, like the weather. Yet, most of us check the weather every day and then put on a sweater, open an umbrella, or reach for a frosty beverage—that is, we do what is in our power to adapt to our experience of the day. On the other hand, most of us do not put the same amount of thought into our energy and attitude that we do in the weather report. In truth, when it comes to personal, group, or workplace energy and attitude, we should be willing to make those same kinds of adjustments and adaptations. A simple physical warm-up is “Eights,” a process in which each hand and each foot is shaken one limb at a time, first counting up to eight and then seven and then six… all the way down to one. We pick up speed as numbers decrease. That simple physical “shaking” not only brings the energy up, it also tends to bring a smile to faces as well, and those smiles—smiles of connection with the group— always pay off when the group uses this newfound bump in energy as momentum and moves on to the task at hand. Energy and Attitude are also contagious. We lead by example – so lend your positive energy to the room. Keep that energy going through various means, such as making the meeting shorter, keeping it relevant to those attending, and even making it a “standing meeting” to keep people’s energy up. To be engaged is to be engaging. If you focus on engaging the people in the room, you will increase your chances of keeping them engaged. Keep in mind, however, that you can’t ultimately control others. Exercise: Ask a group, from 5 to 15 folks, to plan a party—an office holiday bash, someone’s birthday, the anniversary of a merger, the introduction of a new pair of shoes; anything will do! One by one, each person in the group must add a single idea to the party planning list and each person must begin her/his idea sentence with “Yes, but… (and complete the sentence)” Go! After a round or two ask the group, “How many ideas did you fully agree on?” The answer is usually along the lines of “Not many” (if any at all). If “but” does its usual job, it will have succeeded in negating, dismissing, contradicting, and undermining every idea that it follows. Be thoughtful and use improvisation techniques in the right place with the right group. Not every audience is the right audience to try out humor and improvisation! What do you think of the concept of “YES AND?” Have you tried it? Let us know by leaving us a voicemail at 1-646-653-9278 or sending us a message here.